Dallas Leadership Foundation (DLF) refuses to stand back and accept the statistics about the growing prison population in Texas. Through DLF Reentry we mentor incarcerated men and women working in partnership with local churches and organizations that serve the prison population. Operating a pre- and post-entry program through designated dorms in Hutchins State Jail, DLF supports individuals seeking a fresh start by walking side-by-side with them to develop individual service plans designed to help them successfully return to society. Since 2001, DLF has successfully developed leaders from within and outside of prison. 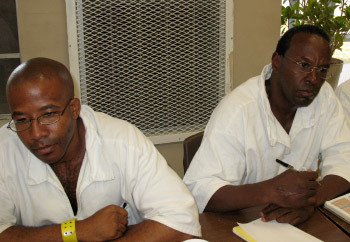 The goal of our reentry program is to help those leaving prison to return successfully to society and not recidivate. We connect former inmates to resources such as clothing and medical care, provide employment helps, courses on living substance free, and encourage their efforts to reunite with their families. 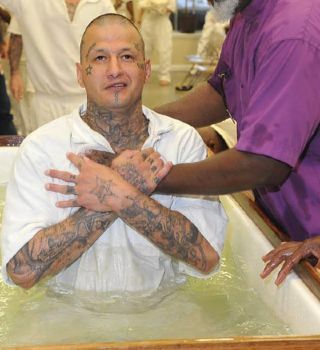 Our prison ministry includes pre- and post-release programs for men at Hutchins State Jail. Within Hutchins State Jail we oversee four faith-based dorms with classes on servant leadership, parenting, budgeting, and more. Upon release, some of the previously incarcerated men that we serve at Hutchins will be housed at DLF’s transitional house, Onesimus House, located within one of our oldest target neighborhoods (Owenwood) in East Dallas. On a weekly basis, our reentry team provides transportation, clothing, classes on overcoming substance abuse, and a weekly fellowship for the previously incarcerated and their families at Smokey John’s Bar-B-Que & Home Cooking.